Home Apple iPhone How Can I Stop Someone from Installing Apps on an iPhone 7? 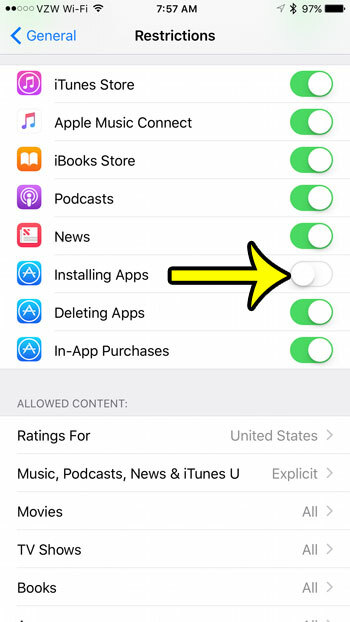 How Can I Stop Someone from Installing Apps on an iPhone 7? While one of the main appealing characteristics of an iPhone is the access to the App Store, certain situations might dictate that an iPhone user not have access to all of those apps. Whether this is meant as a way to control the content that is available on a child’s phone, or as a means to ensure that an employee’s iPhone is only used for business purposes, you may find yourself in a predicament where you would like to simply block the ability to download and install apps. Fortunately this is possible on the iPhone 7 with the help of a settings menu called Restrictions. 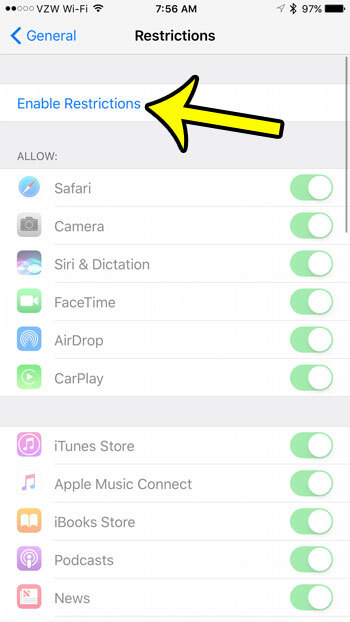 We will show you how to enable Restrictions in the steps below, then indicate which option to turn off so that new apps cannot be installed on the iPhone. The steps below were written using an iPhone 7 Plus, in iOS 10.2. You are going to be creating a new, separate password for a settings menu called Restrictions in the steps below. This passcode should be different than the one used to unlock the iPhone. It is very important that you remember this new passcode, otherwise you will not be able to change any of the settings that you enable or disable on the Restrictions menu in the steps below. Step 2: Open the General menu. Step 3: Scroll down and tap the Restrictions option. Step 4: Tap the blue Enable Restrictions button at the top of the screen. 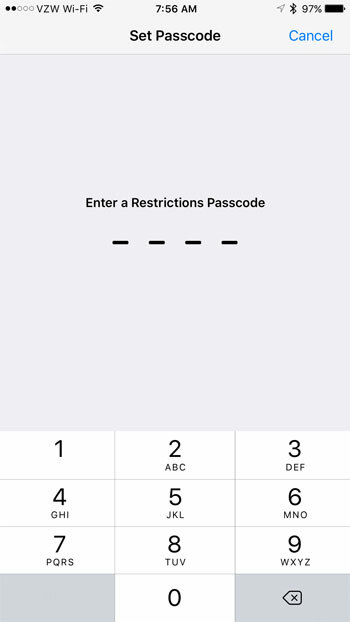 Step 5: Create a passcode for the Restrictions menu. Step 6: Re-enter the Restrictions passcode to confirm it. 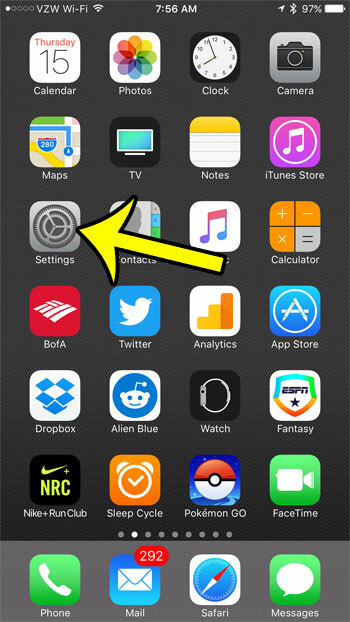 Step 7: Scroll down and tap the button to the right of Installing Apps. The setting is turned off when there is no green shading around the button. 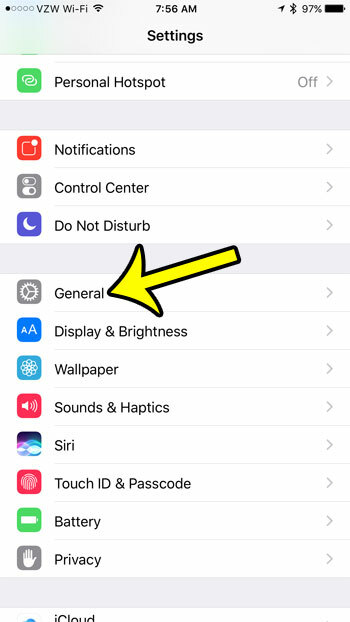 Once you have turned off this setting, the App Store icon will be removed from the Home screen. 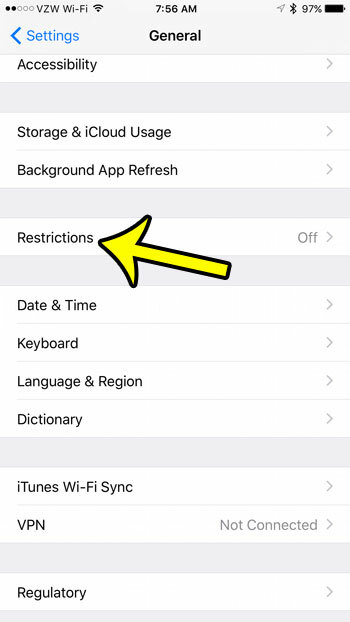 If you decide later that you no longer wish to use Restrictions on this iPhone, then read this article on disabling Restrictions to see how you can turn them off.